Hobbits & Hairdye: What I got for Birthday/Christmas 2013. What I got for Birthday/Christmas 2013. I know theres mixed feelings regarding these kinds of post, but personally I really enjoy reading them and don't see it as bragging at all, I just find it really interesting to see what other people have received…but then again I am pretty nosy! So as my birthday was the beginning of December I thought I'd do a joint 'what I got for birthday/christmas.' If you don't like these posts feel free not to read it, no ones forcing you to, I enjoy reading them so I thought I'd share it for those who are nosy like me and may be interested. My main present from both my parents was money so there isn't really much to show there. My housemates got me some really lovely presents, they brought me a Great British Bake Off Cook Book, an Orchid (you all know how I feel about orchids by now!) & a three month GlossyBox subscription that starts end of January! So generous! I'm so excited for the first one to arrive! From my Grandparents I wanted to get something that would be a keepsake & always remind me of my 21st birthday, so I thought a piece of Jewellery would be a good idea. 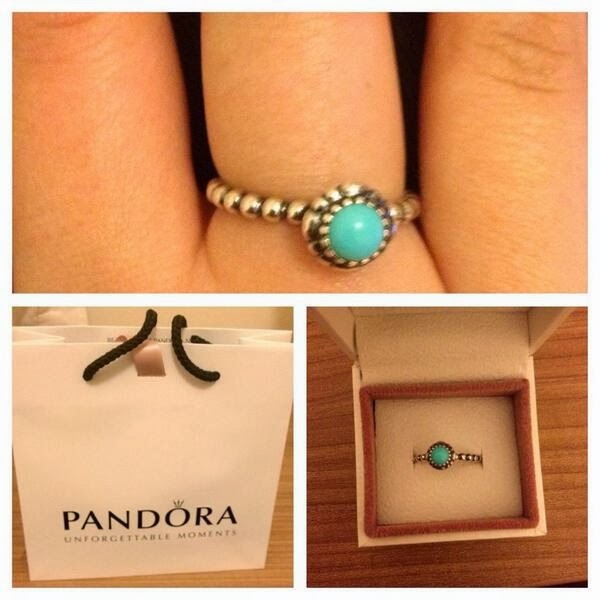 I've always loved Pandora rings so I chose this one, which has got my birthstone in as well! Its a gorgeous ring to add to my collection and will always remind me of my 21st! I love it. For Christmas my Dad & Step Mum got me tickets to see Les Miserables in the west end, I'm hoping for 2014 to be the year of experiences, I love the film, and have wanted to see the musical for ages, so I'm very excited to have the opportunity to see it this year. Daisy by Marc Jacobs is my favourite perfume ever so I was pretty gutted when my bottle ran out in October & with my student budget I couldn't quite justify buying it for myself so luckily for Christmas I got not one but two bottles! One from my dad & one from my grannie! Phew! hopefully this now means I won't run out for a long 'ol while. My mum knows how much I love a lipstick so she treated me to two of my most desired shades Mac - Rebel & Mac - Morange! They are such beautiful colours I'm so excited to use them but at the same time slightly scared to use them in case I mess them up (is that strange?). Christmas would't be complete without some Lush Goodies and some Soap & Glory goodies, its safe to say I'm going to be clean and nice smelling for the whole of 2014! I feel so grateful for all the gifts I've received for my birthday and for Christmas! I've been well and truly spoiled and can't wait to use all my goodies. Whats the best gift you received? and whats the best gift you gave? Love that ring it's gorgeous! I love these type of posts and don't understand the hate some people get for them (especially on youtube). I even included what my dog and rabbit got for xmas in mine haha. You got lovely gifts and the ring in particular is fab for sentimental-ness.